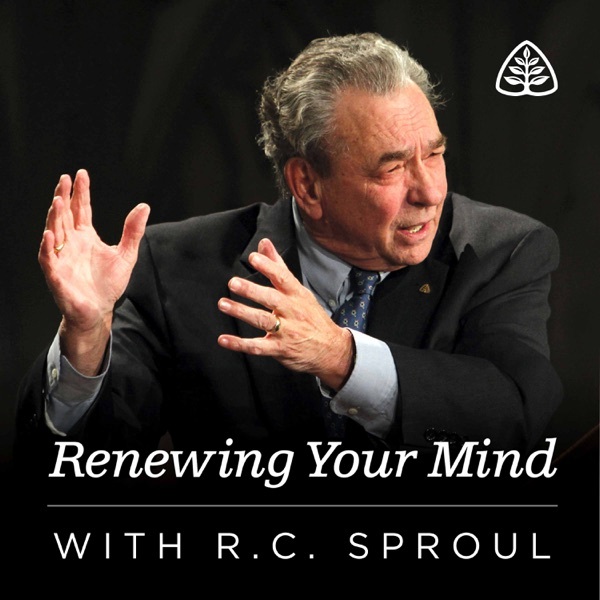 Brilliant, and necessary systematic theology from Mr R. C. Sproul, presented in a humble tone. From his series The Cross of Christ, R.C. Sproul helps us understand the cross in light of God’s covenants. How can sinful people stand in the presence of the holy God? From his series The Cross of Christ, R.C. Sproul discusses the doctrine of justification. In our day, many people choose the authority of science over that of theology. But this is hardly a new practice. From his series The Consequences of Ideas, R.C. Sproul surveys the “new science” of the Renaissance. In the 11th century, Anselm set forth his argument for the existence of God—and people have been talking about it ever since. From his series The Consequences of Ideas, R.C. Sproul examines this argument and why it's so controversial. The laws of cause and effect prove there must be a self-existent origin, an “uncaused cause” of all that exists. From his series Defending Your Faith, R.C. Sproul explains that only the God of Scripture can fill that role. To many people, holiness is a foreign concept. But to the authors of Scripture, it is one of God’s most prominent attributes. Today, Steven Lawson considers the holiness of God. Nothing is outside the scope of God’s rule and authority. Today, Steven Lawson discusses the sovereignty of God. How would you describe God? Today, Steven Lawson explains that our understanding of God determines how we think, live, and worship. When God looks at you, He sees Christ. From his expositional series in the book of Romans, R.C. Sproul explains what it means to be covered by the cloak of Christ’s righteousness. From his series The Intimate Marriage, listen today on Renewing Your Mind with R.C. Sproul as R.C. Sproul considers how fear and guilt manifest in marriage. One of the earliest symbols of redemption was when God covered His naked creatures with clothes. From his series The Intimate Marriage, R.C. Sproul looks at this tender act. What is the Christian life all about? From his Classic Collection, R.C. Sproul helps us understand how to honor Christ and glorify God with our lives. In Genesis 22, we read that God tested Abraham by commanding him to journey to a mountain and sacrifice his beloved son. How could God do such a thing? From his Classic Collection, R.C. Sproul takes us through this dramatic story all the way to its ultimate fulfillment in Jesus Christ. God promised to give Abraham children as numerous as the stars. But Abraham did not see how this could happen. In his old age, how could he possibly bear a son? From his Classic Collection, R.C. Sproul shares a lesson on trusting God. God commands us to love Him with all our heart and soul and mind. But when have we ever done that? From his expositional series in the book of Romans, R.C. Sproul explains that we have all broken God’s greatest commandment. We must not only answer the objections people raise about Christianity, but also make a positive case for our faith. From his series Defending Your Faith, R.C. Sproul considers defensive and offensive apologetics. In John 17:9, Jesus says, “I am not praying for the world but for those whom you have given me.” What did He mean by that? From his expositional series in the Gospel of John, R.C. Sproul considers this exclusive statement in Jesus’ High Priestly Prayer. When Jesus was arrested, tried, and killed, His disciples were broken and seemingly without hope. But soon their sorrow would turn to joy. From his expositional series in the Gospel of John, R.C. Sproul discusses this dramatic shift. True conversion isn’t about taking a sacrament or joining a church. It’s about being brought to your knees by the conviction of the Holy Spirit. From his expositional series in the Gospel of John, R.C. Sproul discusses repentance and forgiveness. The Bible promises that believers in Jesus Christ will have joy. But you might be surprised by how we obtain it. From his expositional series in the Gospel of John, R.C. Sproul explains what it means to be marked by joy. True disciples bear spiritual fruit, and there is only one way we can be fruitful: by abiding in Jesus Christ. From his expositional series in the Gospel of John, R.C. Sproul teaches on the parable of the vine and the branches. In the book of Romans, the Apostle Paul makes a starling declaration: everyone has sinned and deserves God’s wrath. From his expositional series, R.C. Sproul considers the universal guilt of the human race. Apologetics isn’t about apologizing for our faith. It’s about giving an answer in defense of what we believe. From his series Defending Your Faith, R.C. Sproul explains the task of apologetics. John Owen’s library housed books on just about every topic, from theology to literature, music, and history. Today, Michael Reeves considers Owen’s broad intellect. John Owen didn’t just study hard. He pushed himself with such intensity that he practically wrecked his health. Today, Michael Reeves explains what drove Owen’s work ethic. The death of King Charles I ushered in a period of unprecedented freedom for the English Puritans. Today, Michael Reeves takes a close look at some of their reforms. Thomas Goodwin was once considered the greatest interpreter of the Apostle Paul who ever lived. Yet many Christians today have never heard of him. Today, Michael Reeves introduces us to this important English Puritan. By 1600, to be English was to be Protestant, and to be Roman Catholic was to be treacherous. Today, Michael Reeves picks up the story of the English Reformation with the reigns of Queen Elizabeth and King James. Most people have a tendency to think too highly of themselves. From his expositional series in the book of Romans, R.C. Sproul reminds us that against the standard of God’s holy law, not one of us is righteous. One by one, the Lord calls His pilgrims to depart this life and join Him. Today, Derek Thomas concludes his series on The Pilgrim’s Progress. Is there a proper way to be baptized? What about immersion, sprinkling, pouring, or dripping? From his series Covenant Baptism, R.C. Sproul discusses the mode of baptism. The Bible talks not only about water baptism but about baptism of the Holy Spirit. From his series Covenant Baptism, R.C. Sproul explains the relationship between the two. Baptism is a sign that points beyond itself. But what is it a sign of? From his series Covenant Baptism, R.C. Sproul discusses the meaning of this sacrament. Is baptism necessary for salvation? Or is it optional? From his series Covenant Baptism, R.C. Sproul discusses the meaning and importance of baptism. Before Jesus commanded His followers to baptize disciples, John was already baptizing people in the river Jordan. From his series Covenant Baptism, R.C. Sproul compares John’s baptism to that of the Apostles. For a limited time, we will send you the Covenant Baptism CD series with R.C. Sproul and the new book by Guy Richard, Baptism, for your gift of any amount. Your gift helps support Renewing Your Mind and the global outreach of Ligonier Ministries. Christiana and her fellow travelers are nearing the end of their pilgrimage. Today, Derek Thomas discusses their journey through the Delectable Mountains, Enchanted Ground, and Beulah Land. Some people think it doesn’t matter what you believe as long as you believe it sincerely. From his series Justified by Faith Alone, R.C. Sproul explains that what you believe has eternal consequences. Salvation is not dependent upon man, or even upon God and man. It’s dependent upon God alone. Today, Steven Lawson discusses God’s sovereign grace. The more carefully you read the Bible, the more you discover the doctrines of grace. Today, Steven Lawson traces these five doctrines in the New Testament. God has clearly revealed Himself in nature and Scripture. So why do some people claim there is not enough evidence to believe in Him? From his expositional series in the book of Romans, R.C. Sproul explains that ignorance is no excuse for unbelief. God makes some amazing promises in Scripture. Are they too good to be true? In this message from Ligonier’s 2002 National Conference, R.C. Sproul explains that we can trust God to keep His promises. If you are a Christian, you are a member of the church universal—God’s elect from all times and places. In this message from Ligonier’s 2006 National Conference, R.C. Sproul teaches about the church’s triumphant future. We cannot pick and choose which parts of the Bible to believe. In this message from Ligonier’s 2002 National Conference, R.C. Sproul explains that we must submit to the authority of God’s Word. When we are awakened to the holiness of God, we also experience a hunger and thirst for worship. In this message from Ligonier’s 2001 National Conference, R.C. Sproul explains how our worship gives honor and glory to the holy God. 46 years ago today, the Supreme Court legalized abortion on demand in the United States. And since that day, millions of babies have been killed in the womb. In this interview from 2013, R.C. Sproul, John MacArthur, and Chris Larson discuss this national tragedy. After Jesus ascended into heaven, the disciples returned to Jerusalem rejoicing. From his series Dust to Glory, R.C. Sproul explains why Jesus’ ascension should also bring us joy. Skeptics question whether the resurrection actually happened. But we have the eyewitness testimony of people who saw, touched, and spoke with the risen Lord. From his series Dust to Glory, R.C. Sproul helps us defend this historical event. On the cross, Jesus bore the sins of His people and satisfied the demands of God’s justice. From his series Dust to Glory, R.C. Sproul discusses the atonement. The early Christians faced threats from outside the church—and from within. From his expositional series in the book of Galatians, R.C. Sproul looks at the dangers of persecution and false teaching. When Christian begins his journey in The Pilgrim’s Progress, he leaves behind a wife and children who are hostile to Christianity. Today, Derek Thomas considers how the Holy Spirit uses Christian‘s faith to soften his family’s hearts. The Holy Spirit was with Jesus and empowered Him throughout the whole course of His ministry. Today, Sinclair Ferguson considers a few of these moments in Jesus’ life. The Gospels tell us that when Jesus was baptized, the Holy Spirit descended on Him like a dove. Today, Sinclair Ferguson looks at this mysterious event. Is the Holy Spirit in the Old Testament? Today, Sinclair Ferguson explains how the Spirit prepared God's people for the coming of Jesus Christ. Who is the Holy Spirit? What kind of character does He have? And how can we come to know Him? Today, listen as Sinclair Ferguson answers these questions and more. You cannot work your way into the kingdom of God. From his expositional series in the book of Galatians, R.C. Sproul exposes this monstrous lie. When Christian approaches the Celestial City, fear of death gives way to the joy of entering the King’s presence. Today, Derek Thomas discusses this wonderful description of death in The Pilgrim’s Progress. What does an ancient book have to do with our lives today? Stephen Nichols explains that even in the 21st century, the Bible is a sufficient guide for life. Since the Holy Spirit leads us into all truth (John 16:13), why are there so many interpretations of the Bible? Today, Stephen Nichols discusses the clarity of Scripture. Have you ever wondered why there are 66 books in the Bible? And why those particular books and not others? Today, Stephen Nichols explains the development of the canon. The Bible doesn’t just reveal the truth. It stands in authority over us. Today, Stephen Nichols explains why we must submit to God’s Word. When should someone leave a church? Recorded during his live Q&A sessions, R.C. Sproul answers some of the more difficult questions he’s commonly asked. Exercising discipline is one of the most loving things a church can do. From his expositional series in the book of Galatians, R.C. Sproul considers the right practice of church discipline. The Puritans called the Lord’s Day “the market day of the soul” because you find things you didn’t know you needed. Today, Derek Thomas explores John Bunyan’s illustration of the church in the Delectable Mountains. Can sola Scriptura be defended from Scripture? Recorded during his live Q&A sessions, R.C. Sproul answers questions about Reformed theology, leadership in the church, and the end times. Do we have free will? Recorded during his live Q&A sessions, R.C. Sproul answers questions about predestination, God’s providence, and the human will. Since Jesus Christ is God, why did He have to learn things? Recorded during his live Q&A sessions, R.C. Sproul answers questions about the person of Christ, images of Christ, and prayer. As we remember the birth of Jesus Christ, we should also consider why He came into this world: to lay down His life for His people. In this classic Christmas message from R.C. Sproul, he reminds us of the great cost of our redemption. Since God has already predestined all those who will be saved, why should we evangelize? From his classic series Chosen by God, R.C. Sproul offers a compelling answer to this question. The peace of God surpasses all understanding (Phil. 4:7). From his expositional series in the book of Galatians, R.C. Sproul looks at this fruit of the Holy Spirit. Christian’s journey to the Celestial City is waylaid by enemies on the outside and doubts on the inside. Yet every step of the way, we discover that he is never alone. Today, Derek Thomas continues his discussion on The Pilgrim’s Progress. Since God alone is responsible for the salvation of the elect, does that mean He creates unbelief in everyone else? From his classic series Chosen by God, R.C. Sproul clearly establishes that God is not the author of sin.